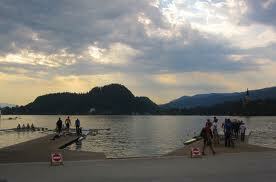 We’ve just discovered that the evening is a great time to row here in Bled. The sun was just starting to set over the mountains at the finish line of the rowing course when we launched. 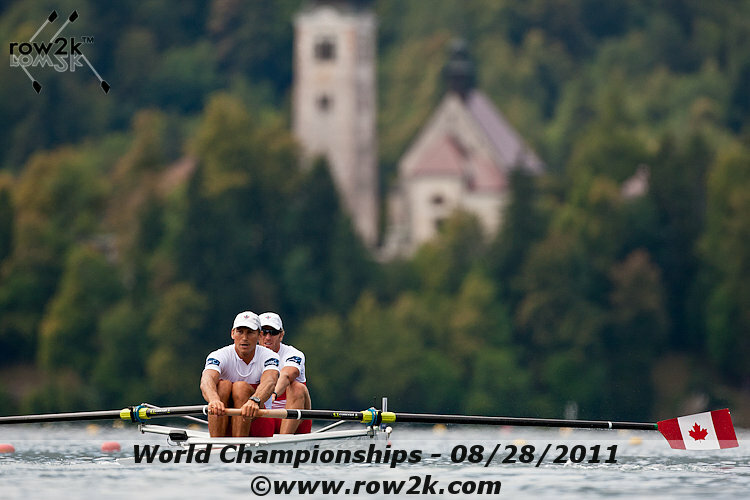 There were probably only a dozen or so boats out on the entire course – it felt like we had the place to ourselves. We had a great row. We got back to the basics with a few drills; stroke progression, Russian-catch drill, legs only, and of course a little pause-drill are our staples. Off the pause at half slide we’d square before heading up to the catch – that feeling of ultimate readiness for the catch is such a confidence builder, even for this rower! Before we headed down for our row Terry (Paul) showed us the draw for the semi finals. In our semi we have (in alphabetical order) France, Germany, Great Britain, Hungary, and the United States of America. In the other semi Australia, Greece, Italy, New Zealand, The Netherlands and Serbia (also in alphabetical order) will face off. There are 11 qualification spots open for London to these 12 crews. The top 3 from each semi will advance to the final, while the bottom 3 will go to the B final.